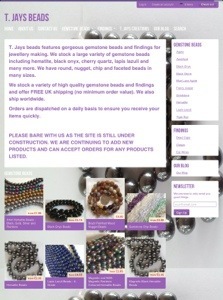 We have created a website for our gemstone beads and findings. T Jays Beads features all of the beautiful gemstone beads that we sell on eBay and Etsy. We offer free UK shipping and as always we ship worldwide. You will receive the same great service by ordering through our site AND you will receive a better price. Please bare with us as we are still constructing the site, therefore not all of our gemstone beads and findings have been listed. You will however be able to purchase any of the items already listed. We look forward to see you on our new site soon!